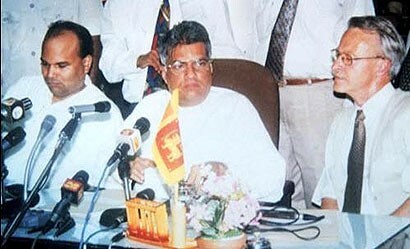 Winning hearts and minds of terrorists, mentality of surrender, advocating theory of unwinnable war” and policy of appeasing, reducing the country to a pariah state, knowingly giving a terrorist organization status on par with a sovereign state and a democratic government were the characteristics of those led by Ranil Wickremasinghe that went on to sign the 2002 infamous ceasefire agreement today described as one of the greatest betrayals of the nation. Ranil Wickremasinghe was the Prime Minister of Sri Lanka who entered into the 2002 Ceasefire Agreement that signed sovereign territory to a terrorist organization so that he could stay in power. The chance given to Ranil Wickremasinghe to lead Sri Lanka was destroyed by his own folly the country cannot and should not trust him again. Those that boast of Ranil Wickremasinghe’s vision must take note that this single agreement was detrimental to the country, the people and the forces and this remains an unpardonable crime never to be forgotten. The supporters of the ceasefire were those that equated the removal of checkpoints giving them freedom of movement as a victory for freedom and peace to the entire nation. Little did these people think what these removals” and carte blanches would eventually mean to the entire nation. Lust for power is what we have seen in the manner cross overs are taking place. People have waited for elections to be announced and deals to be struck to cry foul about corruption. Those that hunger for personal glory and international acceptance rarely view what is good for the nation above their personal gains. These weaknesses as one should view them led to blindness to the reality of what the 2002 ceasefire agreement actually entailed. The lack of consultation and the total disregard for the views of the People of Sri Lanka depicted arrogance of those that hungered for personal glory. The lessons are that these very protagonists signatory to the agreement and those that praised it and spoke in favor of it are not suited to be entrusted with handling any matters related to Sri Lanka’s sovereignty and territorial integrity – ever. Unfortunately, some of these players continue to hold key portfolios and continue to maintain the same mentality and questions those that watch these officials once again attempt to dig Sri Lanka’s grave. It was Kathy Stone writing to the Weekend Liberal in 2002 that exposed how LTTE would have used Charles Gnanakone to strike a deal with the UNF Government that led to the 2002 CFA. Incidentally, it was Gnanakone’s brother who smuggled shipments of weapons to the LTTE via our own customs. It was Ranil’s Chief Negotiator and our present Foreign Minister who went to the extent of requesting the lifting of the ban on the LTTE that his predecessor Mr. Lakshman Kadiragamar worked hard to achieve. Did we also forget to say that this same Chief Negotiator and present Foreign Minister called Anton Balasingham as Your Excellency”! It was Subramaniam Swamy who declared that the UNF Government of Ranil Wickremasinghe functioned according to a Surrender Mentality” and when the entire show was being led by a Chief Negotiator and present FM we realize that same mentality prevails. The question is did the present Government win a war to succumb to surrender? The bargaining was what was missing on the side of SL at all times throughout the peace talks. Why are the Sri Lankan leaders not reading between the lines of the dangers likely to result. GLP called his victory of negotiating the CFA deal with the LTTE a road map for peace” – and yes, he remains our FM, did he meant it or was he told to say so. In our eyes, anyone honourable would depart like Mr. Gamini Jayasuriya when he disagreed with the signing of the Indo-Lanka Accord. We have no regard for people who cross over during elections and call leaders worse than Prabakaran just to please a gallery. It was Madam Maria Carrilho, Member of the EU Parliament and Head of Parliament Delegation for Relations with South Asia who went on to say that a new autonomous State will emerge as a result of the CFA and a flag and new anthem should also be given and the then PM’s secretary appears not to have even protested against it. Signatories : GOSL and LTTE (Ranil Wickremasinghe and Prabakaran) Ranil signed agreement and handed it to Norways Ambassador John Westburg in Vavuniya, while Prabakaran signed in Kilinochchi. Ranil Wickremasinghe (then Prime Minister of UNF Government) did not inform his own cabinet nor the President of Sri Lanka (Chandrika Bandaranaike) of the agreement being signed. The nationalists viewed the signing as one of the greatest betrayals of the nation no different to the signing of the Kotte Kingdom to the Portuguese by Don Juan Dharmapala and the signing of the Kandyan Convention on 2 March 1815 to the British. In fact many a time, Ranil Wickremasinghe has been likened to Don Juan Dharmapala! 6 rounds of talks abroad were subsequently held between GOSL and LTTE – all failed. CFA helped legitimize LTTE’s defacto state. LTTE smuggled shipments of arms, sophisticated communication equipment through SL’s own customs and there are officials and advisors even with the present Govt who were responsible for those approvals. Ranil’s Govt gave LTTE 95% of their Eelaam and the rest the LTTE planned to secure through the ISGA/PTOMS with the former President playing Santa with Sri Lanka. o Forward defense locations – GOSL and LTTE can hold their ground positions maintaining separation of 600metres, movement possible but an absolute minimum distance of 400metres to be kept between them. GOSL and LTTE to provide information to the Sri Lanka Monitoring Mission (SLMM) regarding defense localities in all areas and SLMM will draw up demarcation lines. GOSL and LTTE cannot move munitions, explosives or military equipment into area controlled by the other Party. Tamil paramilitary groups to be disarmed by GOSL. individual combatants” unarmed and in plain clothes can visit families and friends under control of GOSL and visits to be limited to 6 days every second month. GOSL and LTTE reserve right to deny entry to specified military areas. 50 unarmed LTTE members shall for political work be permitted freedom of movement in areas of North and East dominated by GOSL. 100 unarmed LTTE members shall be permitted freedom of movement as of D-day +60, and all unarmed LTTE members shall be permitted freedom of movement as of D-day+90. LTTE members to carry ID papers. GOSL and LTTE to undertake confidence-building measures to restore normalcy. GOSL and LTTE shall abstain from hostile acts against civilian population including acts as torture, intimidation, abduction, extortion and harassment. GOSL and LTTE shall refrain from engaging in activities or propagating ideas that could offend cultural or religious sensitivities. SL Army to vacate all places of worship that it is occupying. GOSL and LTTE to ensure unimpeded flow of non-military goods to and from the LTTE-dominated areas with exception of certain items. GOSL and LTTE to establish checkpoints at locations on their line of control to facilitate flow of goods and movement of civilians. GOSL and LTTE to facilitate extension of rail service on Batticoloa-line to Welikanda – repairs to be done by GOSL. Easing of fishing restrictions – but fishing will not be permitted in harbours or approaches to harbours, bays and estuaries along the coast. Norway to appoint Head of Sri Lanka Monitoring Mission (HoM) who will be final authority regarding interpretation of CFA. Head of SLMM to decide date of SLMM’s operations. GOSL and LTTE agree that search operations and arrests under Prevention of Terrorism Act shall not take place. Arrests will be under Criminal Procedure Code. Local monitoring committee in each of the 6 offices set up shall have 5 members (2 appointed by GOSL, 2 by LTTE and 1 appointed by HoM) the international monitor shall chair committee. GOSL and LTTE responsible for protection and security arrangements of all SLMM members. GOSL and LTTE to notify consent to be bound by the Agreement through letter to the Norwegian Foreign Affairs Ministry. Termination of agreement can be given by either Party to Norway within 14 days of advance notice. The number of violations committed by the LTTE was well over 10,000 as many of these were not even tabulated. The LTTE violations included constructing new positions, firing weapons, moving military equipment, deploying weapons, carrying out offensive naval operations, illegally transporting arms and committing hostile acts against civilians which included intimidation and abductions of adults and children – every clause of the agreement violated by the LTTE and not a hum from even Norway or SL Government that signed the agreement. The very fact that those signatory agreed to place LTTE a terrorist organization in par with a democratic government itself is shameful and allowing LTTE free movement and the capacity to virtually redraw their boundaries only sums the fact that there is no better word to describe these protagonists of the ceasefire than traitors”. These are reasons not to trust Ranil Wickremasinghe. His vision, his competencies and abilities aside the 2002 agreement was signed with LTTE in secret and his own Ministers were clueless and that does not give the people any confidence as a result of his conduct however likable a person he is. The country and the people cannot be entrusted to him especially in the manner he has put Maithripala to contest on his behalf until he takes over after 100 days. It is these factors that are being viewed by the majority of the people. How about what happens TODAY? In addition to LLRC traitors (appointed by us), look at the international panel appointed by MR! They have a history of prosecuting people! These are proven WESTERN AGENTS who prosecuted third world leaders AND SOLDIERS for war crimes! Why did we bring these butchers to SL? Isn’t this worse than the CFA? Please answer HONESTLY. You KNOW the blunder the LLRC did!! SL will be another YUGOSLAVIA or SIERRA LEONE soon thanks to these people. Rt Hon Sir Desmond de Silva, QC, (Chairman) is a world authority on the law of armed conflict. He was personally picked by Kofi Annan, the last Secretary General of the United Nations, to be the Chief Prosecutor of a UN sponsored international criminal court. Sir Desmond commands a large legal practice in London and for 25 years was the head of one of London’s oldest sets of Chambers once headed by the legendary Sir Dingle Foot, QC. Having followed in the distinguished legal footsteps of his father and grandfather, Sir Desmond was Knighted by The Queen in 2007 for his extraordinary contribution to International Law. In 2011, he was made a Member of Her Majesty’s Privy Council. His wide practice has, over the past decade, involved cases that concerned States, Heads of States and Heads of Governments. The British Government in 2010, appointed him to chair a highly sensitive Review into the British Security Services and their conduct in Northern Ireland during the conflict between the IRA and the British forces. Professor Sir Geoffrey Nice, QC, (Member) is the Gresham Professor of International Law in London. He was the lead Prosecutor in the case of the late President Milosevic of Serbia at The Hague. Not true. My3 is not going to hand over the President post. Now there is no physical war. But North and East provinces are governed by the separatists. Please give a call to these two councils in Sinhala now and see what there response is. Keep of speaking in Sinhala. Very soon full betrayal will follow. Shenali, Kudos to you for giving us all a timely reminder of those dark days! Lorenzo, let’s cut to the chase here and also let’s be done with pulling-wool-over-eyes and dumping smoke-screens to confuse the PERTINENT FACT shall we? This is NOT about what an advisory “appointed panel” (by MR) WILL DO IN THE FUTURE, but it is all about what this DANGEROUSLY STUPID RUN-NIL DID in 2002, and what he is likely to DO from 2015 on if this pathetically gullible My3 wins! It is all too evident that RUN-NIL has not learned any lessons, but if any, he has become even more DANGEROUSLY STUPID over the years since he, as the Executive PM, gave into this horrendous stupidity that saw LTTE become a very formidable military force. The litany of bungling and stark moronic actions by this DANGEROUSLY STUPID gook that Shenali has highlighted here are undeniable. Anyone who dares to deny this record has to be one of RUN-NIL’s sidekicks or a die-hard LTTE-separatist-terrorist gook. This is why I say all patriotic Sri Lankans must NOT allow My3 to win. This is not a simple My3 vs. MR battle in this true sense of a democratic contest. NO, this is something HORRENDOUSLY INSIDIOUS and it is the duty of every patriotic Sri Lankan to assure that it never comes to fruition! Imagine this same DANGEROULSY STUPID gook once again taking reins and compromising our hard-won national security – and this time that he would do it through the backdoor as he knows well that he is known as a prized stupid gook by the majority of the nation! Anyway, back to the point – Shenali, Kudos to you for this timely reminder! Thanks! MR goes to Endia to worship a HINDU Thirupathi shrine while My3 goes to SRI DALADA MALIGAWA. Ancient SL beliefs says the person who is blessed by the SRI DALADA MALIGAWA is MOST suited to rule to country. YES! YOU ARE ABSOLUTELY WRONG because you are MISSING THE FOREST by focusing on INDIVIDUAL TREES. Your interpretation of MR’s visiting Tirupati is WRONG; it is not the ISSUE you claim it to be, NOR is it SIGNIFICANT! ONCE AGAIN you are HARPING ON INSIGNIFICANT issues, trying to DIVIDE & CONQUER to favor your election client, ignoring the ELEPHANT IN THE ROOM! MR is not the President of the BUDDHISTS ONLY; he is the President of ALL Sri Lankans, belonging to ALL of Sri Lanka’s RELIGIONS! He has gone to Tirupati because he wants to show to his fellow Hindu citizens that he honors their religion too. After all, Hinduism is the CLOSEST to his own Buddhist religion of all religions existing in Sri Lanka, sharing many fundamental concepts. For the same reason, he HONORS the Christian religion by inviting the Pope to visit, and HONORS moderate Muslims by inviting Former Prime Minister of Malaysia, Dr Mahathir Mohamad to inaugurate two residential development projects in SRi Lanka. In these ways, he builds friendly alliances for Sri Lanka and indirectly honors the religions of local communities. We recall, your strenuous DEMONIZATION of Narendra Modi not too long ago, and bitterly criticism of MR for going to Modi’s inauguration. But to your great credit you ADMITTED YOUR ERROR when that INITIATIVE yielded ENORMOUS DIPLOMATIC DIVIDENDS for Sri Lanka. Your were GRIEVOUSLY WRONG then, dear Lorenzo; you are EQUALLY WRONG NOW! Those who try demonize the President to advance their own agendas, grounded in their own prejudices, desperately trying to minimize his achievements, his fairness and the justice he delivers to all, magnifying and misinterpreting every one of his action through COMMUNAL lenses, designed to PIT the People of Sri Lanka against EACH OTHER and AGAINST HIM, are ABSOLUTELY WRONG and WILL BE SOUNDLY DEFEATED by the Patriotic People of Sri Lanka in whose hearts the message of the President has RESONATED and been PROFOUNDLY UNDERSTOOD and APPRECIATED! There are NONE SO DEAF as THOSE WHO REFUSE TO LISTEN with an OPEN UNBIASED MIND! Lorenzo – these people BOOST the credibility of Sri Lanka’s own internal investigation, making it much more credible than the UNHRC’s investigation. So when you are trying to persuade ‘other countries’ at the UNHRC, UN Security Council, and UN General Assembly that they should not take any action against Sri Lanka, the Sri Lanka internal investigation with THESE kind of people will convince the international community that its own investigation findings should be favored over the UNHRC findings. THAT is what I TOLD HIM yesterday, I AM TELLING HIM now, and I WILL TELL HIM tomorrow as well for good measure! Poor Lorenzo the bloke now has TWO of his old friends bawling him out! He will now hit you with an ITEMIZED LIST of INSIGNIFICANT RED-HERRING complaints against MR, and you will spend ALL YOUR TIME responding to this LITANY as he shifts his ground to avoid the incoming flak on undefendable items! Ananda, agree, I think we have to be very careful with this “DEMONIZATION of Narendra Modi” as that is exactly what the vile LTTE terra-maggots want us to do today! Yes, they would love to see nothing but real bad-blood between us and Narendra Modi and the sooner it happens, the better it is for their eelam-project. Yesterday the police in AP stopped all the “organized” TN protestors from crossing over the Andra Pradesh to protest MR’s visit there to the Thirupathi shrine and this was not we had with the former SoniaG Congress, which was dilly-dallying and pandering to the LTTE diaspora goaded/financed “we-Tamil” racist-separatist elements TN! In the end, I heard the TN we-Tamil racists gooks had no choice but to tuck their tails between their legs (and where ever else for that matter, LOL) and head back to their own racist cesspit in TN! I believe NM of India is determined to “take India forward” and to that end he is determined to not pander to the type of vile, narrow-scoped racism we see in TN (i.e. at the expense of International Relations), so I think just as MR has been doing commendably, SL as a whole just has to align accordingly, but of course while being on our guard (unlike the Run-nil gook who would let guard down at the first handshake of a corrupt, pro-LTTE western gook). The point of Shanali’s article above is RANIL/Maithripala cannot be trusted with power in Sri Lanka if one looks at Ranil’s past actions when he sold Sri Lanka down the river before. As much as others want to make this election about good governance, corruption, or whatever they think will split the Buddhist vote (e.g., Lorenzo’s India fascination, or fixation on MR’ s diplomatic overtures and efforts to diffuse Western influence), the vote is going to be about the wisdom of RANIL regaining power in Sri Lanka. Buddhist VOTERS are just not as stupid as the US Embassy folks – who run Ranil – think that they are and this will be apparent to all on January 8th. Indeed. Anyone who has a problem with a Sri Lankan Buddhist visiting a Hindu temple (anywhere on the planet for that matter) got to have their wires crossed! Say what? Does such person want to carry out a “religious cleansing” of their own kind (sort of like LTTE terra-maggots did) and go around Sri Lanka and demolish all the dedicated chapels/adobes today we have for Hindu gods? What a hilarious topic this is! I cannot believe that it even came up in the context of modicum of intelligence we have within the members of this forum! Just last week you posted a video some Modi’s Endians discussing SL. You CRITICISED them and said everyone should view it! Today you HAIL Modi! What is going on? BTW My3 came in a dress similar to Modi’s to the Kandy rally and people shouted Modi! Modi! OK; if I accept Hinduism is the closest religion to Buddhism, why didn’t he go to a Hindu kovil in SL? There is plenty. And then why did he invite the POPE? And promised to pay taxpayers money for poor Muslims to go to Mecca? I remember Premathasa also visited Endian kovils and Endian sages in 1993. LLRC was also appointed as an ADVISORY PANEL and its recommendations were ONLY recommendations. But what happened? Now we are stuck with it. MR and Lalith promised to fully implement them without being selective. These 3 PRO-UK AND PRO-US WAR CRIMES PROSECUTORS are EXTRENELY dangerous. Look at their past! They framed Milosovic but let the most barbaric genocidal killers get away! Why couldn’t we get anyone from China or Russia or SL? Why do we need advice from war crimes prosecutors when our forces have committed NO war crimes! The ONLY war criminals alive are KP, KA, Pillayan, etc. Just punish them in SL law. Finish. No need to bring foreigners to meddle in our internal affairs like Run-nil brought Norway. Let us not forget the facts. there is no need to get attach to one family , who alone saved the country, rather doing harm now. 1. JR was bout to completely finish off LTTE when India unofficially invaded. LTTE was not as strong those days but so is the army. But the world support was nil those days compared to 2009. 2. There was only ONE MAN who was brave enough to show Sinhala feelings by hitting Rajiv Gandhi. Where were the heroes then ? Even the current president was silent. 3. Runil went to the polls and told public that he will stop the war and all the barricades and people voted for him. People were so down those days they wanted to see the war ended even by giving the North to Tamils. This is what the general feeling was. So Runil did what he promised, although it was clearly a blatant betrayal of the motherland. 4. For many years people didn’t care about a war, they were happy about the ceasefire agreement initially. It was JHU mainly was who kept insisting war can be won. If was definitely not SLFP or the president. It is though JHU’s initiative and persistence that finally war was finished , under the leadership of the current president. But after the war ended president started going in the opposite direction. In addition to people mentioned by Shenali, Milinda Moragoda too was involved heavily. Most of those traitors are back in the government now, as Lorenzo pointed out. Everything happening now is secretive and one man show. all the bad lot is surrounding the president. Tamils have almost got their demands and the President will be giving in a lot more after the elections. He did not declare he will not give any thing more. Did he ? JHU is no more there to guide him. Therefore I clearly suspect a 2nd round of betrayal is coming. This is in addition to the great harm done to our religion, language and culture. You said “you posted a video some Modi’s Endians discussing SL”. No, you have it WRONG AGAIN … you should have viewed the video yourself, before commenting on it. Those were not “Modi’s Indians” but a panel of Indian Political Pundits interviewed by RJTV. They had no relationship to Narendra Modi. “OK; if I accept Hinduism is the closest religion to Buddhism, why didn’t he go to a Hindu kovil in SL? There is plenty. I have ALREADY addressed and explained to you why he does these thiings in MY COMMENT. There is NO NEED for me to PLOUGH THE SAME FIELD AGAIN! These are NON-ISSUES you are trying to BUILD UP into mountains in you INSIGNIFICANT LITANY of criticism! So Modi keeps those who DON’T APPROVE his policies? Come one Ananda. Get real. They said Modi’s plans. No. You have not addressed the Thirupathi over Dalada Maligawa issue. People are discussing these things everywhere. AT LEAST NOW MR should visit Dalada Maligawa. The crossover tally is at 12:2 for My3:MR.
Another 3.5% shift (7 MPs) will put My3 on top. No, Lorenzo, MP crossovers are NOT a proxy for voter sentiment. This is why we have a presidential election rather than have parliament select the president. considering the history of GL I do not understand why MR gave him the chance to represent our country. I have met him few times and he has no common sense. The last sentence is a totally untrue. In fact so, once the report was out, it was made clear from the beginning that while some recommendations were implementable (and now implemented), others were not do-able due to various reasons, including the prevailing toxic anti-SL actions from the pro-LTTE diaspora that shows there is still a very formidable dark cloud hanging over SL’s national security. In fact so, the GOSL’s refusal to adopt some LLRC recommendations have been used by the SL regime-change longing western govts as ammunition to attach GOSL at every fora, including at UNHRC sessions. Therefore to say that “MR and Lalith promised to fully implement them without being selective” is not only disingenuous but mischievous too! Anyway, sadly, I see you missed the key point in my submission. I repeat: What we need to worry more about is not the one of conjectural nature, i.e. as to what someone MIGHT DO (i.e. in this case per you, this “advisory panel”), but rather what someone DID (i.e. dangerously stupid Run-nil the gook as the executive PM) with disastrous consequences to national security that is estimated to have cost over 20,000 lives of our brave Ranavirus to undo years later! This man was never fit for the job and he was a destructive element to our national security when he was the side-kick of Run-nil, when Run-nil handed over SL’s national security to Norway! RUNIL AND CHANDRIKA WERE BOTH SCARED OF THEIR LIVES. THEY THOUGHT THE MEGOLOMANIAC WAS “IT”. SO THEY TRIED TO APPEASE HIM. UTTER COWARDS, WHEN THEY HAD THE COMMAND OF THE TRI FORCES AND POLICE. Your calculation is wrong because it includes BONUS SEATS and national list seats. So you cannot use totals. That is why I used the CHANGE. MR won 57% but UPFA won 62% in parliament. Your starting point should be 57%, not 62%. I think what VAKISTA a very experienced politics intel officer said is right. But there is a long way to get there. 1. I agree. LLRC and appointing 3 pro-US war crimes prosecutors as advisors to the MISSING PERSONS INVESTIGATION COMMISSION are things someone DID. He has automatically connected “missing persons” with war crimes. 2. Run-nil did that treason because the president CBK LOVED it. It was CBK who brought Norway and Run-nil AND MR continued with them. Only in 2008 we kicked them out. And look what Run-nil did under DB WIJETUNGA. NO CFA! Why? Because DBW (being a good man) NEVER had stupid love for LTTE. So Run-nil as PM cannot do any of those under My3. Besides parliamentary elections are due soon. Run-nil can be PM only until then. 3. And under whose leadership did LTTE (=TNA) became chief ministers? 4. Who reduced the army in Jaffna to 13,000 (NOT enough at all). Even CBK-RW DID NOT do this in 2003. 5. Tamil IDPs were resettled in record time but Sinhala and Muslim IDPs for DECADES NOT resettled still. 6. VESAVALAMI LAW still continues denying non Tamils land ownership in the north. 7. KP and KA are still not punished. 8. We released 11,000 terrorists to the society. I don’t believe they can be rehabilitated. 9. Who had the 2/3 but NEVER even attempted to SCRAP 13 amendment. I want you to stop and think what will happen with these 3 pro-US war crimes prosecutors advising our missing persons commission. They know only ONE thing – war crimes prosecution to appease the queen and USA! My ONLY concern is the country NOT politics. IF we go on like this there will be further demilitarization, commissions, foreigners telling us what to do, Vesawalami law, NO resettlement of non Tamils in the north, KP VVIP, etc. And how about Hack-him, KP, KA, DAYAN J? Do you see it is not just GLP? They think the President is the one defeated LTTE. They want to see good roads, visit new hotels and have a good time when they visit Sri Lanka. They are blinded by desire. They don’t see the imminent dangers, because they trust the president and president only. All others are worthless. Milinda Moragoda is well connected to USA. He is one of the pioneers of CFA although did not take a front seat. Now he is heading sabotage of Silk Road project to satisfy India. Soon, few Army Brigadiers will be blamed sent to war crimes tribunal. More powers will be given to North (Tamil) and East (Muslim) to get more Indian support and Middle East support. Merry way of the economy will continue until the bond interests and repayment cannot be continued any more. We will be back to 1989. major disaster is looming. Only hope is a National Government under My3 to combat International Slavery. MS doesn't have the CAPACITY to govern 'any' country, and there is absolutely nothing in his background or ANY achievement he can claim of any sort that would suggest otherwise. And if he were elected by some freak chance, he would not have the POWER to govern the country. He is therefore a COMPLETE FRAUD on the national stage, fronting for the US, UK, and Norway that want t to divide and destabilize Sri Lanka for their own purposes. If MR was actually doing the bidding of the US, UK, and Norway as suggested by Lorenzo, there would not be any UNHRC war crimes accusations at all as these are the countries that are sponsoring the UNHRC war crimes resolutions. There would also be no need for these countries to try to prop up and sponsor opposition against MR by trying to bribe ministers with green cards, houses, and scholarships for their kids in the United States in the hope that they crossover and oppose the president. You really need to study US regime change in other places in the world – especially the so-called Arab Spring. What you will find is the same nice sounding but totally disingenuous nonsense they are trying to push here – democracy, good governance, media freedom – in which they really do not care whether the opposition has the democratic majority support of the people living in the country (look at Egypt where the majority party was actually BANNED). They don't care what the people want, they only care what THEY want, and are therefore no better than the imaginary dictator that they want to get rid of. At least MR is ELECTED by the people, whereas these shadow forces supporting MS hide in the dark, unable to face the electorate that they claim to support. Helaya, I agree 100%. G.L. Peris was a Rhodes scholar. Do you know what they are taught to do when they get back home? Confuse the Government and disrupt normal functioning government. Google to find out what Cyril Rhodes did in South Africa. Helaya thanks again. Why MR got him was to balance out some issues that are not visible to the naked eye. I do not know. I hope he will be replaced after the election. Any way let’s give little credit to him. He carried out what MR wanted him to do. Did confront Navi Pilluva head on. GL is one of the brightest lights in the government who actually understand the maneuvering of the US, UK, and Norway and how to counter it with relations with specific countries. If that is not PRACTICAL, I do not know what is, as these relationships have paid huge dividends at the UN and in terms of billions in development dollars for Sri Lanka. Come on Lorenzo, don’t MISINTERPRET what I said, and DRAG RED HERRINGS ACROSS THE TRAIL. You are pretending to be rather DENSE on purpose, are you not? Those are NOT “Modi’s Indians”, PERIOD. Modi did not “keep” that panel on the discussion video on RJTV as you term it; THEY were completely independent political pundits earning a living by pontificating; political commentators like David Brooks and Mark Shields on 60 Minutes on PBS in the USA! THEY HAD NOTHING TO DO either with Modi or with the BJP! Yes, I did address in a more meaningful sense. Furthermore, he has worshipped at the Dalada Maligawa many times before on such occasions, and may yet again do so before he casts his vote on January 8, 2014. Are you micro-managing the Presidents daily schedule of activities now? Another INSIGNIFICANT TASK for you to manage? Taken over from his APPOINTMENTS SECRETARY, have you? NO, Lorenzo does not MISS it; he either deliberately AVOIDS it TOTALLY, or MISINTERPRETS it to DIVERT or DEFUSE the thrust of your comment. He is expert at it, and will keep doing so until it exhausts you! Those, and REPEALING of 13A, are VALID concerns of all Patriots, but the way to address those issues is not to support Western sponsored REGIME CHANGE in Sri Lanka; that just dumps our NATION from the FRYING PAN into the FIRE! Cutting off your NOSE to SPITE your FACE is PLAIN STUPIDITY! THE UNP LEADER HAS ASKED A SLFP GENERAL SECRETARY TO CONTEST ON HIS BEHALF AND GIVE HIM THE REIGNS TO GOVERN SRI LANKA. CAN THIS SALIVATING FOX DO THINGS LIKE THIS THE WAY HE WANTS, BECAUSE HE IS THE INVERTIBRATE LEADER OF THE UNP, AND A LEADER OF THE OPPOSITION, LACKING DISTINCTION.? THIS IS HIGHLY UNCONSTITUTIONAL. SOMEBODY MUST TAKE THIS TO COURTS. ANYBODY WITH A BACKBONE ??? THE CIRCUS HAS COME TO TOWN. TRAL LAL LAAA. Lets do a dispassionate objective analysis. Point #1 – MR’s first term was FANTASTIC! But these things happened in second term. 1. LLRC and appointing 3 pro-US war crimes prosecutors as advisors to the MISSING PERSONS INVESTIGATION COMMISSION are things someone DID. He has automatically connected “missing persons” with war crimes. 10. Chris Nonis our best HC (despite his faults) was assaulted in public in NY. Point #2 – CFA scorecard. These are the CFA engineers from all sides. Where are they now? So you can see ONE is in UNP, ONE in TE (dead) and NINE in the MR camp!! No they do. They ALL SHARE Endian nation interests with the BJP Modi govt! Are they concerned with Pakistan’s national interests? The MORE DIVISIONS the REGIME CHANGE ship-jumping traitors of the Common Opposition SOW, the MORE Sri Lanka’s Local and Foreign Enemies are ENERGIZED, and MORE pain Mother Lanka will REAP! Sensing BLOOD in the WATER, Tamil Nadu Politicians are GEARING UP TO DISMEMBER at Sri Lanka and RE-START their EELAM project. THIS is the PRICE we will pay for UNDERMINING and WEAKENING the GOVERNANCE of our Motherland! PATRIOTS, Rally AROUND the President and the UPFA GOSL at the HUSTINGS, and DELIVER A RESOUNDING MESSAGE with A DEEP-THROATED ROAR to these VULTURES GATHERING OVERHEAD to PROFIT from a WEAKENED Sri Lanka! Ask not For Whom the Warning Bell Tolls, it Tolls for Us! Dec 10, Chennai: The Chief Minister of Tamil Nadu O. Panneerselvam today asked the Indian Prime Minister Narendra Modi to retrieve Sri Lanka’s Katchatheevu Islet as a long term solution to the fishermen issue. The Chief Minister’s request to Prime Minister Modi comes in the wake of the recent arrest of 43 Indian fishermen from Tamil Nadu by the Sri Lanka Navy Tuesday. In a letter, Panneerselvam urged the PM to take measures to retrieve the disputed Katchatheevu Islet and sanction a financial aid package for Diversification of Fisheries as a long term solution to the vexing issue. The CM in his letter noted that the livelihood of our fishermen is being threatened by the Sri Lankan strategy of not releasing their boats which are in the custody of Sri Lanka. “Sri Lankan Government has been pursuing a devious and sinister strategy of not releasing the apprehended fishing boats in successive incidents where Indian fishermen are harassed and arrested while pursuing their peaceful avocation of fishing in their traditional fishing waters in the Palk Bay,” Panneerselvam wrote. The Tamil Nadu government refuses to recognize Sri Lanka’s sovereignty of the Katchatheevu Islet which was ceded to Sri Lanka by India under a Supreme Court decision in 1974. Nor does it recognize the International Maritime Boundary Line (IMBL) set up by an agreement between the two countries in 1976. “The Government of Tamil Nadu reiterates its firm commitment to the restoration of the traditional fishing rights of our fishermen in the Palk Bay and the retrieval of Katchatheevu which had been an integral part of India since time immemorial,” the Chief Minister noted in his letter to the PM. He said the Government of India should also not treat the International Maritime Boundary Line (IMBL) with Sri Lanka as a settled question as the constitutionality of the 1974 and 1976 agreements have been challenged on “extremely valid and legal grounds” by the Tamil Nadu Government. The Chief Minister urged Prime Minister Modi to secure the immediate release of the 66 fishermen who are in the custody of the Sri Lankan authorities as well as 81 fishing boats. Dec 10 (PTI) CHENNAI- NDA ally PMK today said Sri Lanka was treating India ‘badly’ on the issue of arrest of Indian fishermen and called for strong steps to rein in Colombo. Party founder S Ramadoss said the latest incident of arrest had happened on Tuesday, on a day when Lankan President Mahinda Rajapaksa was in India for a personal visit even as Parliament was discussing the fishermen issue with the government responding to it. “These are examples of how badly Sri Lanka treats India on the fishermen issue,” he said in a statement. The Rajapaksa government “should be taught a lesson” it can never forget in this matter, he said but took a dig at Prime Minister Narendra Modi for wishing a third Presidential term for the Lankan leader. He also faulted the state government in its approach in the matter, saying both Chief Minister O Panneerselvam and his predecessor Jayalalithaa confined themselves to just writing letters and urged the former to personally take up the matter with Central government if it failed to warn Sri Lanka. He said India should adopt ‘shock treatment’ tactics followed by former Prime Minister Indira Gandhi and former Chief Minister of the state, M G Ramachandran, but did not elaborate. Dec 09 (PTI) CHENNAI- MDMK General Secretary Vaiko today called on European Union Ambassador Joao Cravinho and other representatives of the EU member countries and sought their support for the “need for a referendum” among Tamils in Sri Lanka. Vaiko called on Cravinho who is heading a delegation of ambassadors representing various EU member countries currently on a three-day visit to Tamil Nadu and Puducherry. He discussed a host of issues including the plight of Tamils in Sri Lanka and the “need for a referendum” among them in the island nation. “The help and contribution of European Union countries in holding a referendum on the Tamils issue in Sri Lanka is very essential,” he said. He also discussed the national and Tamil Nadu political scenario besides commercial and cultural links between EU member countries and India. The MDMK chief also gave compact disc copies of his speech on the travails of Tamils in Sri Lanka. If this is your view about GLP, I don’t think you can think from SL national interests. ALL patriots disagree. BTW as I have given examples, GLP is not alone. IT IS A PATTERN. Please think WHAT is good for SL, not WHO is good for SL FIRST. Then you will see WHO is most suitable. Sonia Gandhi’s Congress party members are also Indians; have they become Modi’s Indians too? MORE OBFUSCATION & MORE MISDIRECTION to defend the indefensible, Lorenzo! Can you please respond to the SIGNIFICANT FACTS I have stated above. You CANNOT deny a single point if you are a true patriot! PREDICTABLY, ANOTHER LIST of complaints DESIGNED to MISDIRECT & CONFUSE! We know who you are trying to FOOL: Voters into believing that the UPFA GOSL has NO OVERWHELMING ACCOMPLISHMENTS, is INCOMPETENT, is irrecoverably CORRUPT, and is UNPATRIOTIC, and lead them by the NOSE like pigs to support the Ship-Jumping Traitor, the uncommonly STUPID Common Candidate, Palwatte Gamaralge Mathripala Yapa Sirisena! You will NOT SUCCEED despite your frantic best efforts, Lorenzo …. Ordinary Voters of Sri Lanka are MUCH TOO SMART! I think ANOTHER PANIC ATTACK is DUE FROM YOU …. ABOUT NOW! You forgot one major crime. Our Navy, our court system, our police and our credibility has been completely demoralised, insulted and condemned by the Tamil Drug convicts release. You are not dealing with the obvious – why is the US trying to bribe ministers to crossover to the opposition if the UPFA is in their camp? Why would they push for war crimes against the UPFA if they are in the US camp? Who are YOU trying to fool, and why? I don’t come here to sling mud at anyone or fight. I come here to state FACTS. You have NOT disputed my FACTS. You have just blamed me and ridiculed what I said without disputing them! WHY? Because these FACTS are facts and cannot be disputed whether they favor MR or My3 (I’m not interested in persons). Where is the evidence? NO evidence. Just newspaper mud attacks. IF you have evidence PLEASE BY ALL MEANS present them to court and charge them with TREASON (an offence in SL law). Why GOSL is NOT doing it? Because they have NO evidence! I can tell you who US, UK, Australia citizens/green card holders are. Except one, all the others are in one camp. Which camp do you think they are? Have they? NEVER! NO ONE has ever pushed for war crimes against UPFA! MR, BR and GR made several trips to USA and NO war crimes nonsense happened (thank god). Everyone knows they have done NO war crimes. It is just a beggar’s wound and a Tamil Elamist belief. I worry about war crimes advice from the 3 PRO-US prosecutors appointed by SL in 2014 against our SOLDIERS AND OFFICERS. This panel must be dissolved IMMEDIATELY! This entry was posted on Wednesday, December 10th, 2014. You can follow any responses to this entry through the RSS 2.0 feed. You can skip to the end and leave a response.